#1 How to Improve Fingerprint Recognition on Biometric Gun Safe? #1.1 Why Using a Biometric Gun Safe is Popular? #1.4 What if I Can’t Decide? #1.5 Is My Fingerprint the Way to Open My Safe? In recent years, biometric security has become of the most popular security techniques on the market. Biometric security is basically the used by identifying the owner by their special characteristics and composition. For example, most smartphones utilize biometric security by using your face or fingerprint to unlock your phone. Although biometric security is most commonly used in smartphones, anything could utilize biometric security. Most recently, gun safes have used biometric security by requiring owners to use their fingerprint to unlock and open their safe. Although biometric security is extremely popular, it doesn’t always work. That being said, here is how you can make sure your biometric gun safe recognizes your fingerprint each and every time. Why Using a Biometric Gun Safe is Popular? Biometric safes are extremely popular for two main reasons. The first reason is the fact that it is one of the safest and most secure ways to lock your safe that’s currently available. After all, since biometric security requires the specific composition and pattern of your fingerprint, it is extremely difficult and time consuming for someone to replicate your fingerprint and therefore access your safe. Just take a second and think about it. After all, burglars want to enter and leave your home as quickly as possible. They don’t have the time or accessible resources to replicate your fingerprint when they’re trying to steal from you. Therefore, they won’t be able to access your safe, and your guns and other possessions will remain secure. This security feature is also helpful if you have children. A harsh reality is gun safes ae often desirable for children because it’s something flashy and mysterious. Most of the time, children don’t even understand what’s inside a gun safe, or the implications of what could happen if they’re able to open it and access your guns. But, if you have a biometric gun safe, you won’t have to worry about your children accidentally opening your gun safe because they won’t be able to use their fingerprint to open it. The third reason why biometric gun safes are extremely popular is the ease of access. Let’s face it: if you ever need to use your gun in an emergency, you’re going to want to be able to access it as quickly as possible. While keys, a padlock, or even a traditional turning lock might be efficient, those techniques don’t even come close to the speed of access you have with utilizing your fingerprint. Like popularity reasons, there are two main reasons why your programmed fingerprint isn’t working. Despite popular belief, there’s a chance that your fingerprint can change. Fingerprints can easily change for a variety of reasons. One of the most common reasons why a fingerprint changes is because of a scratch. Even if a scratch seems insignificant, it could ultimately deter you from opening your gun safe because it could change the composition and pattern of your fingerprint. Scratches aren’t the only thing that can change your fingerprint. For example, your biometric safe might not be able to recognize your fingerprint because you have something on your finger, such as dirt. The second reason why your fingerprint might not be working is the notion that you’re placing your finger in a different position than when you calibrated your fingerprint. Calibration is extremely important. When you calibrate your fingerprint, it’s important to make sure you place your finger the same way you did the first time, every single time you try to open your safe. Even the slightest change in how you place your finger could stop you from opening your safe. So, before freaking out about possibly repairing or replacing your biometric gun safe, try repositioning your finger. If you discover that you have difficulty opening your gun safe often, you might want to consider calibrating your gun safe again because you may have calibrated it in a weird position the first time. How to Always Ensure Your Fingerprint Works? Biometric safes are truly the most convenient & secure storage on the market. That’s why they allow you to calibrate multiple fingerprints. This gives you a few options. You could calibrate different positions with the same finger, a few of your fingers, or even your finger and everyone else’s fingers in your household that you trust opening your safe. Calibrating different positions with the same finger is obviously the most efficient way if you want to ensure that you are the only person who will be able to access your safe. After all, even if a burglar was able to replicate your hand, what’s the chance that they would choose the specific finger you calibrated? Calibrating a few of your fingers is a great option because you don’t have to spend time positioning one of your fingers. In the event that your safe doesn’t recognize your finger, simply move on to one of you other fingers. Program other people’s fingers if you live with multiple people who you trust and want to be able to access your guns and other valuable possessions. This could be especially helpful in an emergency because you might not be able to have the opportunity to access your safe. Also, if for whatever reason your gun safe doesn’t recognize your fingerprint, you can easily get someone else in your household to open the gun safe for you. If you can’t decide which tactic to use, simply use a combination of all of them. Like previously stated, you are able to program multiple fingerprints in most biometric gun safes. 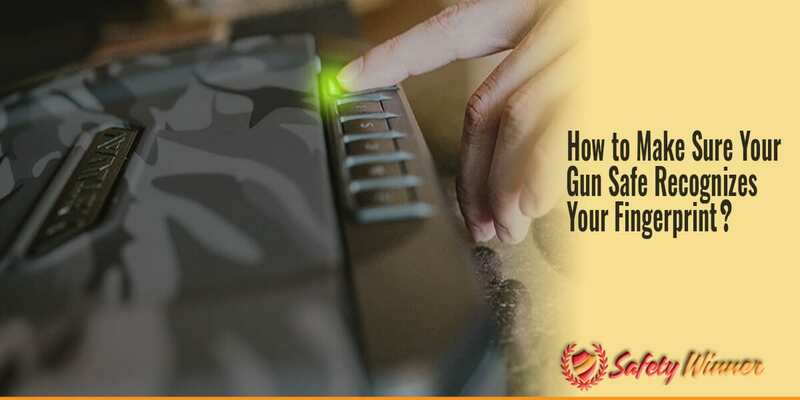 Your biometric gun safe should come with a detailed description of the exact steps you need to take to program a fingerprint, as well as the number of programmed fingerprints you are allowed to have. Is My Fingerprint the Way to Open My Safe? Don’t worry about your fingerprint being the only line of defense. Since biometric technology is still relatively new, most biometric gun safes also come with a key or combination lock. Therefore, you can access your safe through that security measure if your fingerprint doesn’t work.